WHAT HAPPENED: Jared Hamilton’s dunk with 12:08 left in the second half pulled the Eagles to within 53-51. From there, Tyus Battle made two 3-pointers as part of a 9-2 run to put SU up 62-53. Boston College could get no closer than six the rest of the way as Syracuse shook off an ugly loss to Virginia Tech earlier in the week. The Orange had to overcome a sluggish start, trailing 15-6 early. But Syracuse went on a 14-0 run to take a five point lead with 9:48 left to go in the first half, a lead that SU would not relinquish. ANALYSIS: Syracuse enjoyed another stellar offensive night, shooting 55.8 percent from the field and 11-26 from downtown. But the Eagles kept withing reaching distance of SU by getting to the free throw line, hitting 20 shots compared to the Orange’s 8. There was a huge discrepancy in free throws for much of the game until BC was forced to foul in the final two minutes to stop the clock. In the overall NCAA Tournament picture, this goes down as a Quad 2 win since the Orange won on the road. When these two teams meet next week, it will be considered a Quad 3 game since SU is the host. HERO: There was simply no stopping Tyus Battle on Wednesday night. He scored a season-high 31 points on an efficient 11-17 from the field to go with six assist and four rebounds. Without Battle, Boston College’s duo of Jordan Chapman and Ky Bowman may have stolen a win at home, each scoring 21 points. 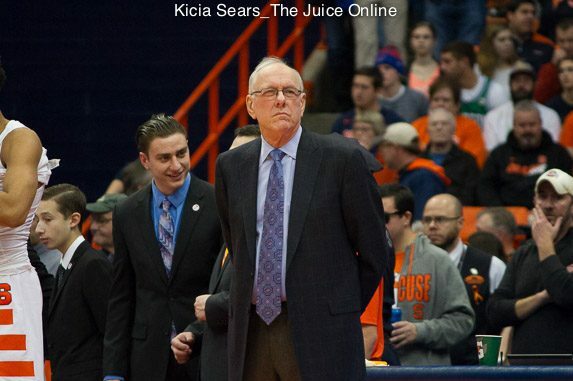 Buddy Boeheim chipped in 13 points off the bench, including three 3-pointers. ZERO: Though Frank Howard finished with nine points, he was a non-factor down the stretch, with head coach Jim Boeheim electing to go with Battle as his primary ball handler and Buddy Boeheim at the top of the zone. Jalen Carey once again couldn’t get off the bench, and seemingly has fallen completely out of the rotation. WHAT’S NEXT: Syracuse finishes its three-game road swing, traveling to PItt on Feb. 2 at 6 p.m. TV: ESPN2.